There are few occasions when the news that someone you have never met has passed away affects you almost as strongly as learning about the death of a loved one. Today, Sir Terry Pratchett, beloved, world rebound author of fantasy and humour, lost his battle with Alzheimers disease. When I was a young teenager a friend of mine recommended I read The Colour of Magic and I borrowed the battered copy from the school library. Previously, I read what I found on my parent’s shelves (mostly Wilbur Smith), along with treasured story books from my childhood (chief among them Heroes and Monsters, a book of Greek myths, and my Penguin Swiss Family Robinson). It was like opening a new world. Of course given the book that might not sound like a strange statement to make. But truly, for the first time I got a sense of how wide the horizons of fiction could be and I wanted to explore them. It marked the point at which I began to develop my own reading tastes. I devoured the book, and the next (The Light Fantastic) and more. I bought my own copies of each of the Discworld series and they soon occupied a whole shelf to themselves. The later instalments are all hardbacks; I was too impatient to wait for the paperbacks. My favourites are the most dog-eared from re-reading; Pyramids, Thief of Time, Going Postal and Good Omens. They will always have a place on my shelf. They will pass down my family. I hope they are read and re-read until they fall to bits. 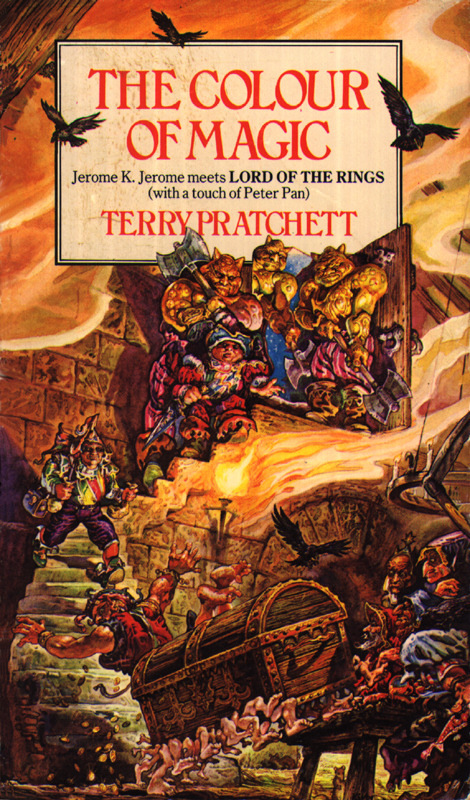 Terry Pratchett opened my eyes to a world of reading and a passion for books and I believe his books will do the same for countless children for generations to come. If I could leave even a fraction of such a legacy when I depart this world I would count myself very lucky. My thoughts go out to the family, friends and fellow fans of this giant of the literary world.